Suitors and Sabotage is Cindy Anstey’s third novel with Swoon Reads, but it’s the first book of hers that I read. Over the past couple of years I have heard great things about Anstey’s historical fiction novels, and I was not disappointed! The year is 1817, and Imogene Chively left her Season in London with one suitor in tow—Ernest Steeple. In order to become better acquainted with one another, Ernest and his younger brother Ben come to stay with Imogene, her family, and their close friends. However, Ben’s charming personality and teasing manner soon swoops Imogene as well as her best friend Emily off their feet. Add in several suspicious accidents, and it seems as if someone is out to sabotage Ben for some unknown reason. From the get go it’s obvious that Ben is the primary love interest. I mean, he saves her dog from harm in the first few pages…Ernest never had a chance. However, Imogene and Ben’s romance is slow and subtle. Imogene tries her hardest to fall for Ernest, especially after Emily shows interest in Ben, and Ben does not betray his brother by openly acted upon any of his feelings, yet both still fall in love with each other in a swoony way. I loved how Imogene’s passion for art shined throughout the novel and how she aspires to open a school of her own, which is impressive considering the time period. Furthermore, I loved how Ben doesn’t even second guess her abilities and seeks her out as a teacher (and later partner). I also appreciated Imogene and Emily’s friendship, especially towards the end. Even though Emily was interested in Ben, she never truly fell for him like Imogene did and their friendship stays intact. 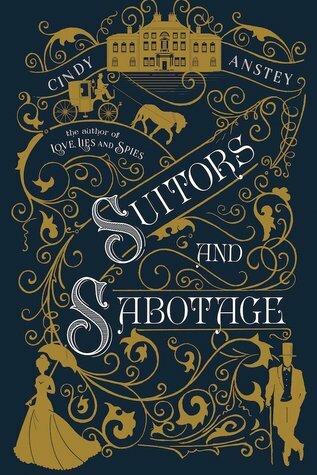 Overall, Suitors and Sabotage was a fun Regency novel, and I look forward to reading Cindy Anstey’s other books in the future! Whenever she is not sitting at the computer, throwing a ball in the backyard, gardening or reading, Cindy can be found–actually, not found–adventuring around the world with her hubby. She has lived on three continents, had a monkey in her yard and a scorpion under her sink, dwelt among castles and canals, enjoyed the jazz of Beale St and attempted to speak French. Cindy loves history, mystery and… a chocolate Labrador called Chester. Love, Lies and Spies is her debut novel. Yay, thank! You’ll have to let me know if you end up reading it! 🙂 Have you read any of the author’s other novels?